around the plaster of paris and secure it with seizing wire. The textile cloth may extend far enough to protect the wire rope from the torch while the terminal is being heated. Heat the terminal carefully and uniformly with the torch, making certain the flame is not directed on the exposed wire rope at the bottom of the asbestos cloth. (See fig. 3-57.) Continue heating the terminal until it begins to radiate heat waves. Remove the torch from the terminal and leave the terminal undisturbed for 30 seconds. Make a mark on the thickest portion of the terminal with a 550 and 600°F Tempilstik. Repeat this at four areas, 90 degrees apart, to ensure an average temperature. The zinc should be at the proper temperature at this time so that the pouring can take place when the terminal is heated to the correct temperature. Do NOT attempt to measure terminal temperature with the portable pyrometer. If the 550°F Tempilstik leaves a wet mark and the 600°F Tempilstik leaves a chalk mark at the four areas, pour the zinc immediately. If the four areas show a wet mark for both the 550 and 600°F Tempilstik, continue checking the four areas every 20 seconds until the 600°F Tempilstik leaves a chalk mark and the 550°F Tempilstik leaves a wet mark; then pour the zinc immediately. If the temperature has fallen below 550°F (550°F Tempilstik leaves a chalk mark), reheat the terminal and proceed again as previously described. Skim the dross (impurities) from the top of the molten zinc before pouring. Use the portable pyrometer to measure the temperature of the molten zinc and to determine, thereby, if the zinc has reached its proper temperature for pouring. (See fig. 3-58.) The temperature of the zinc must be accurately measured with a portable pyrometer. Do not handle the portable pyrometer carelessly, because the millivoltmeter on it is a sensitive, precision instrument. When the portable pyrometer is not in use, keep it in the carrying case. 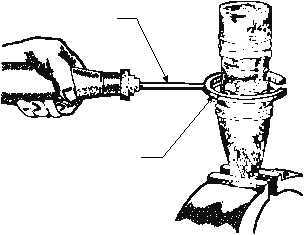 Measure the temperature of the molten zinc by holding the portable pyrometer in one hand and dipping the iron tube of the portable pyrometer in the molten zinc, being sure to keep the thermocouple in the center of the molten zinc and not touching the bottom of the pot. 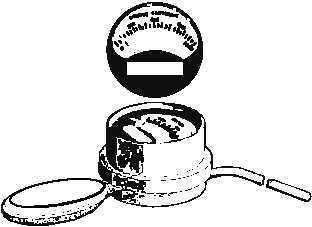 The temperature of the molten zinc will then be indicated on the portable pyrometer dial. Pour zinc at a temperature of 950 to 1,000°F. Pour the zinc into the terminal. Fill it to within 1/2 inch from the top of the textile cloth to provide a sufficient "hot top." Tap the sides of the terminal lightly with wooden sticks during and after pouring of the zinc, until a surface crust forms. See figure 3-59. 3-54 HEATING TORCH HEAT TERMINAL TO 500 F - 600 F O O ABEf0357 Figure 3-57.Heating the terminal. ABEf0358 Figure 3-58.Pyrometer. 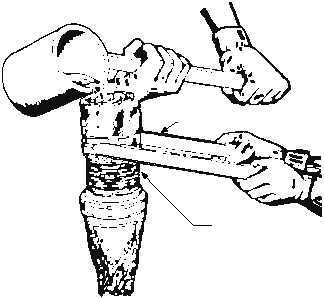 ABEf0359 WOOD STICKS TAP TERMINAL UNTIL SURFACE CRUST HARDENS Figure 3-59.Tapping the terminal during pouring.